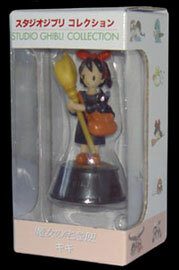 'Chibi' caricature figures of anime and manga characters are nothing new, but when it comes to Studio Ghibli there has always been a touch of seriousness in its merchandising. However, these figures - one from each of Hayao Miyazaki's projects prior to Spirited Away - proves that nothing is above chibification! 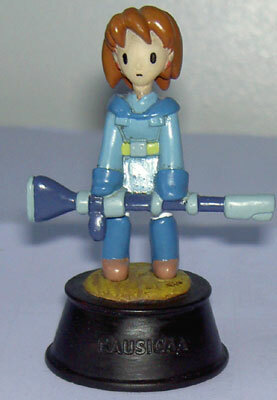 The range of figures is comprised of the female leads from seven Miyazaki projects made between 1984 and 1998, they are: Nausicaä (Nausicaä of the Valley of the Wind); Sheeta (Laputa, Castle in the Sky); Mei (My Neighbour Totoro); Kiki (Kiki's Delivery Service); Fio (Porco Rosso); Winged Girl (On Your Mark); San (Princess Mononoke). 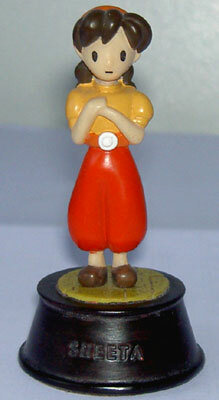 Each figure stands at around 3" (7.5cm) tall and come ready painted, assembled and attached to a small wooden plinth with the character's name in English on the front. 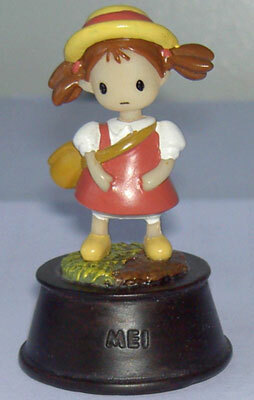 Unlike most other Ghibli figures, which are often very detailed, the ones in this collection are extremely simplistic. 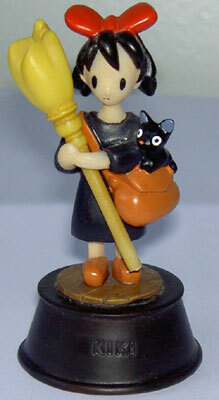 Apart from Kiki and San, the figures have no removable pieces and have a very basic design and painting scheme, with little noticeable shading or fine detail. 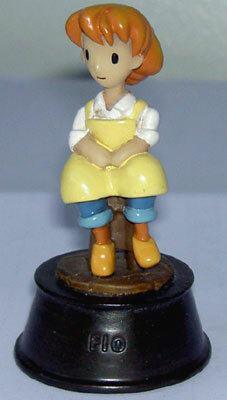 Because of this it is surprising how effectively each figure evokes the character, from Fio nonchalantly sitting on a stool to Mei quizzically tilting her head to one side, the figures are instantly recognisable and appear to have had more thought put into them than the simple design suggests. The base plinths are also nice touches, they are shaped in a similar way to those that Cups and Trophies are often attached to and they really give the figures a touch of class you rarely find with this kind of merchandise. These figures aren't perfect though. It is noticeable if you look closely that some of the painting hasn't been done as carefully as it could have been, with some colours overlapping onto neighbouring areas of the figures. 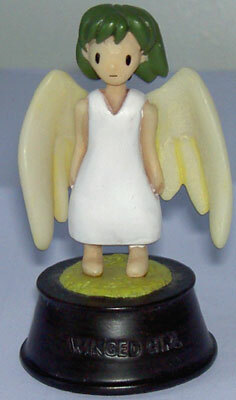 It's a shame that this has happened because for the most part the figures are very well made (the exception being the join work where the wings connect to the body on the winged girl), but it does actually give them a hand-painted look, and considering the high standards Ghibli merchandise is made to it certainly wouldn't surprise me if they were painted by hand. 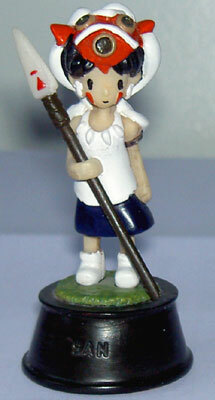 If you can ignore some flaws in the painting these figures are well worth your money. They are fun and well made, and the plinths, which appear to be made from real wood and even have felt pads on the bottom to hold them steady, really put them above the everyday figures. 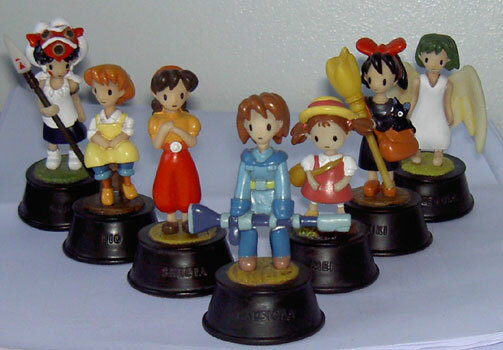 Precious little Ghibli merchandise is available in the UK and these won't be to everyone's taste, but if you are an unashamed Ghibli nut like me and you get the opportunity to buy these figures they are certainly worth a look.